Several scaffolds and teams of workmen were hanging from Erie on the Park, 510 W Erie, last week. 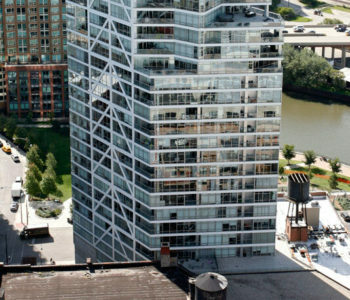 The building, which was completed 10 years ago, was dubbed “Little John” by the Tribune’s Blair Kamin, who saw in it a resemblance to Big John, i.e. Chicago’s Hancock Building. I’ve seen both buildings many times and failed to note the similarity. According to the developer’s website, “Erie on the Park is the first residential steel frame building to be built since Mies van der Rohe.” I have no idea what that sentence intends to claim. According to the architect’s website, “The building possesses all the fundamental attributes of architectural modernism: revealed structure, glass curtain wall, recessed glass-clad lobby, usable rooftop surfaces, and geometric integrity.” I have a better grip on what that statement means, but was surprised to learn that “usable rooftop surfaces” are a fundamental attribute of architectural modernism. Who could have known?